I found this recipe in a Women's Day magazine about 2 years ago. I love how easily it comes together and how you can substitute various ingredients based on what you have in your fridge. I make it with different vegetables each time, as you can see! It calls for broccoli and jarred red pepper, but I've used a combination of spinach, mushrooms, bell pepper, cauliflower, eggplant, zucchini, and canned tomatoes as well. I normally pick 2-3 veggies to use in one strata. I try and add a total of 2 cups of vegetables, so whatever you choose, aim for them to add up to 2 cups worth. It might seem like a breakfast or brunch dish, but once you try it, you'll realize it really is a dinner meal. I serve it with a green salad. 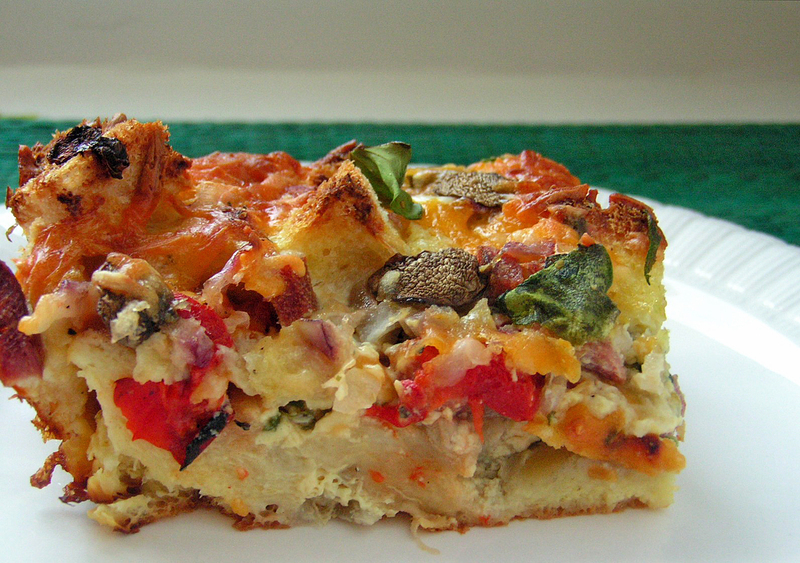 My husband doesn't care for quiche, but loves this strata! This recipe makes one 9×13 or two 8×8 dishes. I opted to make the two 8×8 dishes and put one in the freezer for a meal next month! I just assembled it and baked it about 20 minutes. Let it cool, then wrap in foil and freeze. 2. Whisk eggs, milk, mustard and pepper in large bowl to blend; pour evenly over strata. 3. Bake, uncovered, 45-50 minutes until puffed and golden and a knife inserted in center comes out clean. Let stand 5 minutes before serving. Or cover strata with foil and refrigerate 2 hours or overnight, then bake as above. This entry was posted in A Uncategorized, Main Dishes. Bookmark the permalink. I plan to freeze this ham and cheese strata recipe. So then should it thaw in frig and then bake? What changes since it will be frozen?